Caught in plots between two worlds, his only hope is to awaken the link between them. Kyrus had lived a quiet life as a scribe until his dreams begin seeping into his waking life. Fanciful tales of magic and battle turn out to be real. In his sleep, he witnesses the adventures of his twin. Kyrus is swept up in the intrigues of those who already know of this connection between worlds. As his knowledge of the two worlds grows, so does his entanglement in the intrigues between them. Kyrus discovers friends, lovers, and adversaries among the twinborn. His knowledge of magic grows until he becomes a valuable pawn for masterminds of plots that threaten empires. Kyrus must learn a deadly game against opponents who already know the rules. He must join forces with his twin to combat threats in both worlds. One misstep or misplaced trust and Kyrus could find himself dying… twice. 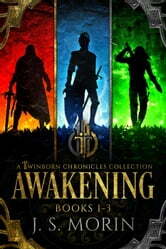 Twinborn Chronicles: Awakening is a three-book collection chronicling the adventures of heroes who alter two worlds. For fans of epic fantasy who aren't looking to start another unfinished series, the Twinborn Chronicles provides multiple new worlds to explore and all the closure you've long been denied.